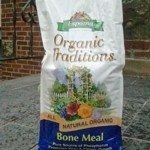 When should I use bone meal on my flower beds? In the fall or spring? After flowers stop blooming? This would be best applied in spring, as when the plants go dormant, they are not taking up nutrients as well as they would during the active growing season. It is very important to note that you should test your soil prior to application to ensure that the pH is below 7, as bone meal will not work at higher soil pH. You can lower this, most effectively with iron sulfate.